Wedding Cinematography re-imagined. Your story on film. Whether the label of our work is wedding cinematography or wedding videography, our goal is to tell your story beautifully on film. Your wedding moments filmed cinematically is our priority, but what really separates our videos from others are the unique stories that we tell in the editing room after the lights die down from your big day. No stone is left unturned as we sift through your footage and piece together a work that truly captures your personalities, quirks, and journey as a couple. Better than telling you, it’s probably best we let our wedding videos do the talking! We are based in Mississauga and we service the GTA (Toronto and beyond). Our motivation to produce unique films that stand the test of time comes not only from our passion for what we do, but most definitely, our couples. Every time we get that first reaction of, 'OMG, we've watched it 1000 times already!' or receive that glowing review, we feel such a sense of satisfaction because we've accomplished our ultimate goal. We would love to be your wedding videographers and make that movie magic with you too! For all non-wedding-related videos, we have a separate corporate video production company based in Mississauga - Films First. 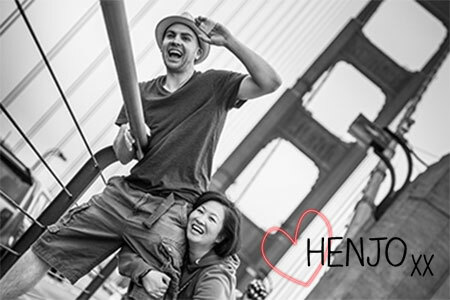 "When we watched our HenjoFilms wedding video for the first time it truly felt as though the people who created it had known us our whole lives." "Hiring Henry and Joanie to be our wedding videographers was the best wedding decision we made...and the easiest."